Our Toddler Program at Lakewood Montessori School gives children ages 15 months to 2.5 years of age a loving, nurturing and secure environment. In order for a toddler to feel comfortable enough to explore and learn, a trusting relationship must exist between the child and their teacher. Before a child is able to form this relationship with his teacher, he must first be able to trust himself. The process of developing self-esteem begins very early in life. Our teachers demonstrate to our toddlers that they are trustworthy individuals. Children in our care are comforted, provided with unconditional love and are assured that they will be protected and kept safe. Our environment allows space for freedom of movement and provides materials that enhance and foster development in all areas of the senses. All of our materials and furniture are child size and are carefully chosen to meet the developmental needs of the children at this age. The classroom is a beautiful, friendly, inviting and very nurturing environment. Our daily schedule that is pre-planned and carefully thought out provides the children with a variety of stimulating and hands on activities which foster the children’s social, emotional, cognitive and physical development. Each child is welcomed, treated with respect and is recognized as their own individual. We encourage open communications between parents and teachers and daily records are kept on each child, informing parents of their child’s accomplishments. The Toddler Program also provides our children with outdoor activities that promote and enhance gross motor development. 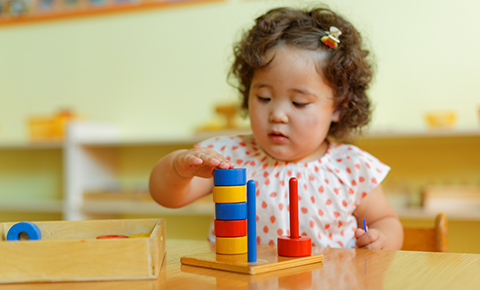 Our toddlers are provided with experiences in Music, Art, Story time and Sensory activities, which will help motivate them to learn, and create the solid foundation in the early years of learning that is essential to future academic success as well as preparing them for the next level in the Montessori ladder, The Casa program. The Practical Life exercises are self-inviting, purposeful activities which are close to real life work. They not only give the child self-confidence, but also satisfy his or her sense of accomplishment. The cycle of activity is simple, clear and short. The results can be seen quickly. These exercises enable the children to develop independence, concentration and hand-eye co-ordination. Practical Life materials are designed to fit in the toddler’s small hands and serve as an invitation to spoon, pour, dust, sweep, button and zipper. Movement is very important for toddlers to assist in strengthening their bodies. Large motor activities stimulate the muscles and develop strength and coordination. A combination of indoor and outdoor play areas are designed to offer opportunity for movement and to build large motor skills. The Sensorial material provides the child with the opportunities to refine all the five senses. The activities involve specially designed materials that are age-appropriate to refine the children’s senses and develop skills. The Toddler Program focuses on the development, comprehension and use of the English language through verbal communication. The teachers guide the children in their conversations with others to develop and expand their language. There are many opportunities for children to socialize and expand their language skills by talking with other children.